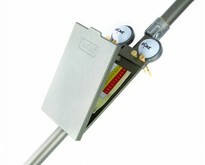 With this fully made of titanium JuCad hand trolley you are a chic appearance on the golf course. And thanks to the handy folding mechanism, this JuCad is very easy to use when folded for transportation / storage. Due to the ultra-smooth wheels with ball bearings, this trolley is incredibly easy to push and you will be amazed by the extra energy you have left. If you play a lot on hilly tracks, we advise you to order the optional brake and for the golfer who takes the trolley a lot in the car, we recommend a transport bag so that trolley times are also 100% protected during transport. You now also have the possibility to compose your trolley yourself. You can do this with the JuCad configurator and then forward the composition to us. We will then ensure that you receive a very competitive offer on the trolley in question within 24 hours.